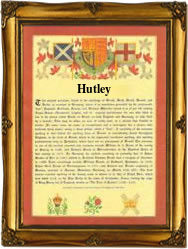 This interesting and unusual surname recorded as Utley, Uttley and Hutley, is of northern English locational origin from a place near Keighley in Yorkshire called Utley. The component elements of the name are the Olde English pre 7th Century personal name "Utta" related to the Saxon "Otta", "riches", plus the Olde English "leah", a wood or clearing; hence, "Utta's leah". Because of the phonetic similarity Otley near Bradford in the West Riding of Yorkshire may also be the source of the surname. Recorded variously as "Ottanlege" circa 1030, in Early Yorkshire Charters, as "Ot(h)elai" in the Domesday Book of 1086, and as "Ottelea" in the 1195 Pipe Rolls of that county, the name translates as "Otta's Leah". On August 15th 1548, Roger Ottlay and Margaret Nodder were married in Rotherham, Yorkshire, Ann Utley, an infant, was christened in Heptonstall on June 11th 1556, and Mary Hutley, the daughter of Robert Hutley, was christened at St Giles church, Cripplegate, London, on April 26th 1698. The first recorded spelling of the family name is shown to be that of Henry Hotlay, which was dated 1379, in the "Poll Tax Returns of Yorkshire", during the reign of King Richard 11, known as "Richard of Bordeaux", 1377 - 1399.